I loved the whole idea of doing a Sunday Supper around saving the wonderful bounty of summer. For the last few years I have grown my own tomatoes, and love doing it. There is just something so satisfying about growing your own food, and then using it in a dish. I have grown peppers the last two years, but my tomatoes have always been my #1 favorite. We love tomatoes just about any way you can prepare them. Fresh, roasted, grilled, smoked, you name it and we will eat it! It is actually kind of funny that I feel the way I do about tomatoes now because growing up I despised, and mean with a passion I despised them. My Mom got so frustrated with my tomato boycott that she actually sat me down at the table and made me eat a cherry tomato. Oh I fought it for quite some time, but finally gave in when she told me that I couldn't leave the table until I ate it. Soooooo I ate one, and it did't stay down long. After that my Mom left me alone when it came to my tomato aversion. He lost his job, wife, home, car, kids, and life. He’d set melons on them and laugh at their squashin’. He vowed to destroy the Tomato Horde. Whose Moment of Truth lay close at hand. Were dumped on their sections to mash them to bits. Tomato Vendetta had claimed its victim. Popularly known as the t-o-m-a-t-o k-e-t-c-h-u-p…. But in my adult years I have learned to love those fresh little read balls of joy, and coming from Southern California one of my absolute favorite ways to nosh on them was in fresh pico de gallo. Oh boy, I can't even imagine how much pico and tortilla chips I have put down over the years. I could actually make a meal of it if I had to. Give me an ice cold Corona, fresh tortilla chips, and some of this gorgeous pico de gallo and I am one happy camper!! Combine all of the ingredients together in a bowl. Cover and refrigerate for at least an hour to allow the flavors to meld. Place in pint jars, making sure the lids are tight. Prep Time: 01 hrs. 15 mins. Now let's save some summer!! "It didn't stay down long." Oh, my, Bobbi! What a story! And to think that you love tomatoes so much now. I'm curious about what made you try them again after that! Pico de gallo is one of my favorite things too. Yours looks so fresh and wonderful! Pass the chips, please. I love the smell of cilantro in my cooking and on my plate. Add some black beans and you have a meal! Oh my goodness look at how bright and fresh and colorful and vibrant your pico de gallo is - wow! I'd want to gobble up a whole jar of it. I've never heard the tomato vendetta song but it was funny. Glad you enjoy them now, and your pico de gallo is so beautiful!!! Ha ha Love the song! Your salsa looks delish! Chips and salsa are one of my all time favorite snacks! LOL, on the tomato aversion!! II was super picky growing up to, didn't like lots of stuff including tomato sauce (my post of today)!!! Now I can't get enough of them. I love your pico de gallo and would eat that whole bowl myself!! Oh, I adore pico de gallo with chips, too! Please pass me a bowl of yours!!!! Nothing like some fresh pico de gallo in the summertime! Isn't it weird how your tastes change? Oh I totally agree, i just love how this pico smells! You know Stacy, I am not really sure. I think when I started trying to cook healthier I decided to give them a try again. I learned that if I seeded them and just ate the flesh I like the taste. Then began roasting them, and now I love them raw. What a great song! I am funny about tomatoes - I love them mostly, but I hate biting into cherry tomatoes - something about the seeds! Your pico de gallo looks absolutely delightful! I make poblano pesto at times. A bit less heat than Hatches, but the good flavor of poblanos. I love poblanos, they would make an awesome pesto too! 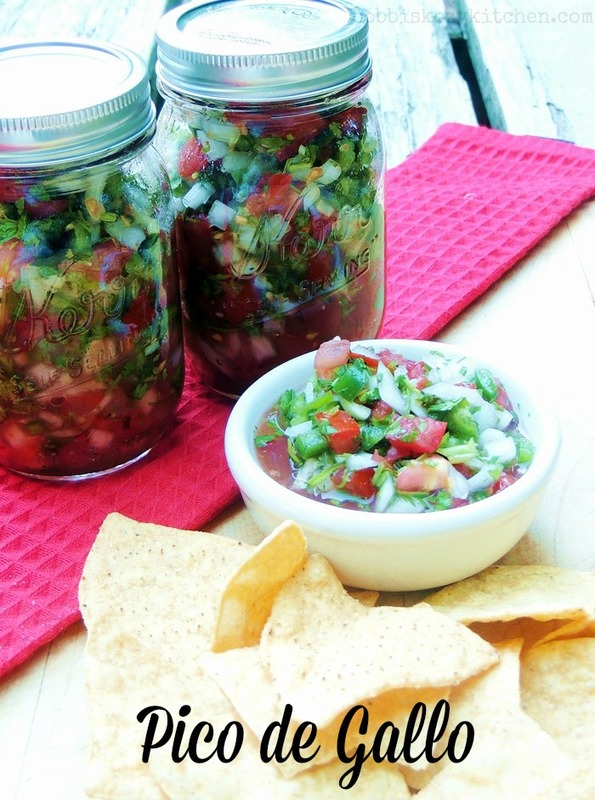 Oh thank you so much for sharing your recipe for Pico de Gallo! Just bought some at Whole Foods this week at $7.00 a pint! Ouch! And it wasn't that good. I have just GOT to make this since I love Pico soooooo much! Thank you! That was a funny story!!! Your pico de gallo looks delicious. So fresh and yummy! I've never heard that song, I'm going to have to look for it. I love pico de gallo! So simple, but so wonderful! Perfect recipe! I made this today for my kids and they ate it with carrots and pitas! Yummy, yummy! Yes, I love it on just about everything!! I know, it is crazy how much they charge for it, and it is super easy to make :) so go for it!! I've never heard that song before. I've never attempted to make Pico de Gallo before either. Break out the freshly fried tortilla chips! Oh you should give it a try! I don't have a color printer but the pesto looked fabulous. It would be great also if you could do groups of cards. I seriously believe you could sell a real cookbook. I know some people rely totally on computers but I know a lot of cooks that still use cookbooks. All of your things look FABULOUS! Fantastic! I'm headed out the door to buy some chips for dinner... this is amazing!! I would have never thought to make your own pico de gallo. This is perfect for when the chip and dip craving strikes! LOVE pico de gallo!! One of my favorite condiments ever. Thanks for posting this! Thanks Alice! I hope you enjoy! !